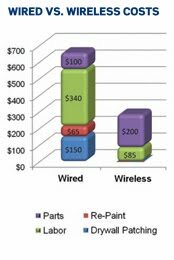 Spot Opportunities (Commercial Blog): Self-Powered Wireless Controls Allow New Installation Opportunities While Saving Time and Reducing Installation Costs By 50% or More! Self-Powered Wireless Controls Allow New Installation Opportunities While Saving Time and Reducing Installation Costs By 50% or More! Has a customer ever asked for a switch in a location where it is difficult or costly to run a wire? How about a detached garage or a room with concrete walls and ceilings? Leviton's LevNet RF™ provides a solution. With LevNet RF, contractors can now offer their customers a reliable cost-effective wireless solution for basic lighting controls and 3-way switching. All without having to pull new wire. LevNet RF helps contractors complete projects in half the time with little to no negative impact to the customer’s operations or damage to the customer’s property. By spending less time on installations and finishing more jobs, contractors can work smarter and generate additional profits for their company. Wireless controls offer the best and most cost effective energy solution to meet today’s government mandates to reduce lighting energy use. Using wireless and self-powered technologies developed and licensed from EnOcean, the worldwide leader in wireless control technology, LevNet RF solutions are maintenance-free, saving ongoing labor and material costs while saving energy. Wireless and self-powered technology means no new wiring, external power, or batteries are required. With no additional wiring required, installation is quick and easy and takes only minutes to configure. LevNet RF offers simple lighting control and configurability for occupancy sensing, ON/OFF switching, 3-way switching, bi-level switching, hotel HVAC control, and much more for design flexibility. No wires, no batteries, and no limits for a flexible and cost-effective energy savings solution in any application – this makes LevNet RF the preferred solution for retrofit and new construction applications. In addition, the LevNet RF line is Made in USA, ARRA, and Buy American compliant.